Hi, crafty friends 🙂 It’s Cassie here. 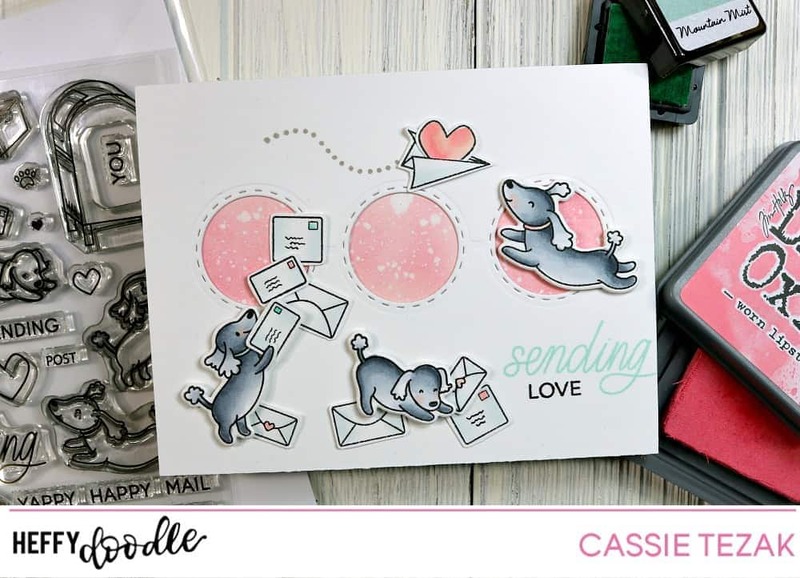 I’m back on the Heffy Doodle blog today to share a sweet card I made using some adorable Heffy Doodle products. Today’s card is a sugary sweet card that could be sent to anyone that’s been on your mind. How sweet are these pups from Yappy Happy Mail?! I just love them. 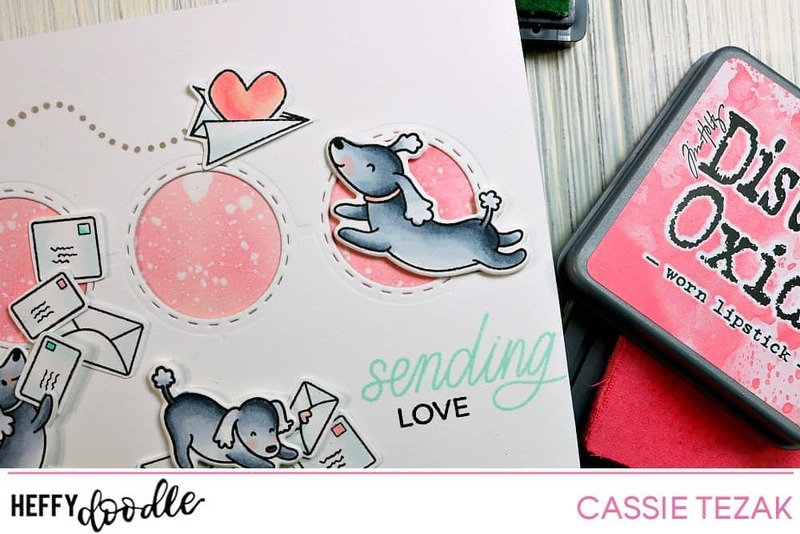 I started today’s card by stamping out a bunch of the images from Yappy Happy Mail, including all of the little puppies, two of each envelope, the large heart and the paper airplane. 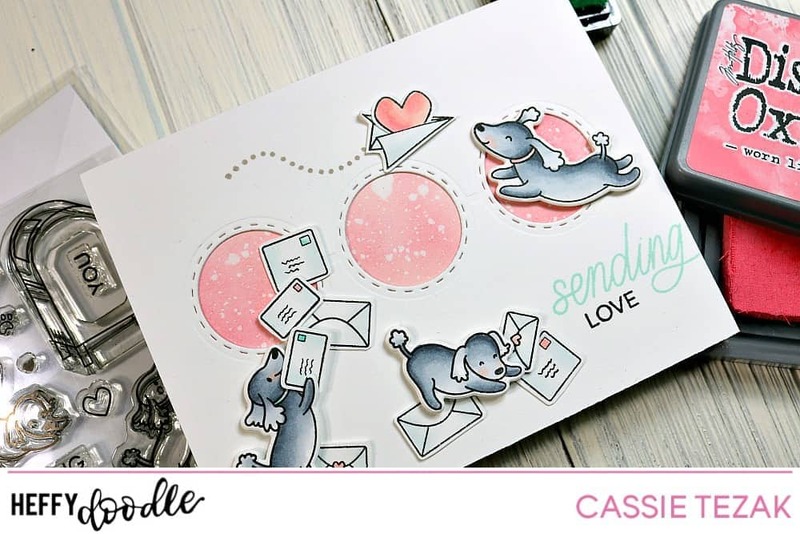 I wanted these little guys to look like they were having so much fun playing with the happy mail they had received (because who isn’t happy to receive happy mail?!). I colored everything in with my Copics, keeping to a very basic color combo. All the dogs were the same gray, and the accents were either pink or aqua. Everything was die cut with the coordinating dies as well. I took a piece of A2 size white card stock and die cut three stitched circles from it. Then, on another piece of A2 size card stock, I ink blended Worn Lipstick Distress Oxide ink over it where the circles would show through. I spritzed it with water to get the white splatter look. These pieces were adhered together once the water was dry. And that’s it for my card today! I hope you enjoyed. What are some of your favorite simple color combos? I have to admit, this is one of my favorites. Thanks so much for stopping by, and I’ll see you again soon with another card!